Over the past four years I have been pretty loyal to my personalized regimen and that loyalty came pretty easily since my hair seemed to favor well from my product regimen, and by favoring well I mean, I was retaining steady growth, moisture and very few split ends but then a change happened in December 2009. I had a small incident with some fire about a year and a half ago when my ends dipped into a candle and my hair caught on fire! Yes ladies, you heard correct my hair caught on fire and I saw some goodness gracious actual real live flames shooting from my hair, but this is a story for another time (maybe funny Friday? Even though at the time I didn’t find a damn thing funny about it) so long story short I was rockin my 140 twist and about 15 twists were more than half singed off with other random pieces frayed by way of fire, which left me with about 10 inches and the rest of my hair at 16 inches. To this date those 15 twist are now at 15 inches with the rest at 21 inches. Now with that being said all this is leading up to how I begin to change my regimen. When something goes wrong in any aspect of my life I look at the reason behind it, the cause, and this was no exception for my hair. I wondered how could my hair explode in flames from simply leaning over a wee itty bitty candle and the answer… because I was using extremely flammable products but not only was it flammable, I was using too much and the fact that it was not all natural my hair could not absorb these products so instead the products just really neglected its true j-o-b and laid around as if on vacation and simply coated my strands. The result was un-natural product coating dry un-moisturized hair because of the strands inability to absorb the artificial ingredients along with a greasy to touch feeling, but to be honest the “greasy to touch feeling” was nothing new for me. As long as my hair did not feel “dry’ I was satisfied despite the fact when people touched my hair I immediately saw the hand wipe down on the nearest fabric available (even though this became a good defense mechanism for preventing people to touch my hair again). I would love to make this story really moral effective by saying I transitioned to mostly all natural products immediately after, but on UBB Nikisha and I offer nothing but the realness so the change of my regimen really didn’t take into effect until Dec 2010 a year later through the persistence of my man, who now had leverage of the fire to throw at me every time I said “well why change something that has been working since forever” Needless to say I am glad I made the transition and my pillowcases are quite pleased as well. Not only did I experience a total depletion in product buildup which cured me of my “Soul Glo” greasy feeling, but I experienced 50% less shedding during detangling, more manageable detangling sessions and itchy scalp ceased to exist. The reason for these changes is because natural products are missing the one main ingredient that is in abundance in un-natural moisturizing products which is mineral oil (aka petroleum). Mineral oils have a tendency to clog your pores to your hair follicles and coat your strands rather than being absorbed by them which can mean more shedding, stunted hair growth and dandruff. I wanted to share my story for those who may be on the brink of transitioning or trying all natural products. I definitely am not knocking all things not natural, shoot I used them for years, I grew up on Blue Magic and Johnson & Johnson’s hair grease. Hell I still use Vo5 conditioner which is not all natural (though it works best for my hair because it is silicone free, which makes it an amazing product) but if you are willing to incorporate some natural products into your regimen you may see a drastic difference for the better! What products have you changed along the way during your natural hair journey? You’re tempting me to switch completely over. But I’ve always used greases — my mother used it on my hair as a kid. So I’m used to them and they’ve been working fine for my hair. I know mineral oil isn’t the greatest… *sigh* I will try the “all-natural” thing for some time and see how it goes. My pillow cases will be thanking me as well, if I completely convert. 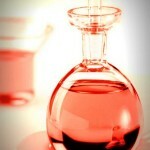 Hey Alee, you can start by implementing 1 or 2 natural oils to start. I know it can be a little difficult when something is working. Girl, lawd knows I was there! I am now using 100% all natural products. I grew up using hair grease and when I stopped relaxing, I was a loyal Miss Jessie’s girl for the 1st 2 years. I was using all the products in their line at the time. I really loved their baby buttercreme though their curly pudding really did nothing for my non existent curls. In 2009, I made the transition to natural products since I was plagued with chronic scalp itching and flaking and I was advised that natural ingredients were a gentler alternative for my sensitive skin. I am glad I did. I no longer have scalp issues and my hair has been growing in quite healthy with less shedding and is not brittle anymore. Amen! 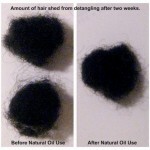 Yes it is amazing how fast natural oils can cure hair problems that ailed me for years. 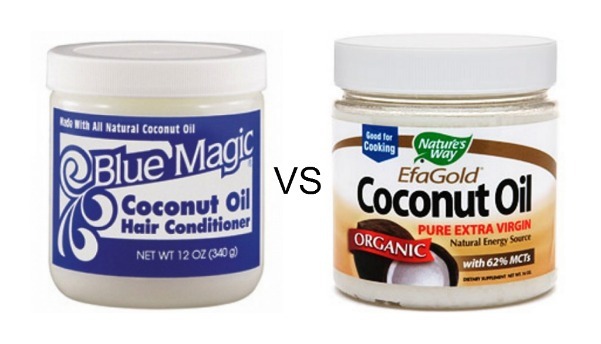 I thought I was the only one that thought they were keeping it natural using that Blue Magic Coconut Oil. But like the saying goes, when you know better, you do better. I have gone au natural with my hair products for the past 7 months and my hair has thanked me for it. Lol, I was right there with you thinking the same thing. I was like “well it has coconut in it” but didn’t realize it is so polluted with mineral oils the little bit of coconut that product has kills the beneficial effects of the coconut. “Blue Magic! Thats a brand name, like Pepsi…thats a brand name! I stand behind it, I guarantee it!” Lmfao excuse my messiness yall. Ive never tried that stuff but I have pretty much cut out all mineral oils and just use lots of natural oils now. Any reccomendations for home made oil mixes?! I always had itchy flaking scalp growing up, so grease was my best friend, always kept my scalp greased too and my hair grew. I got my first mineral oil free product from my hair stylist when I told her that I really wanted my hair in the kitchen area and my temples to grow and catch up to the rest of my hair. Two months later, I was getting compliments from ppl that my hair was longer and did not look weight down and I never looked back. I don’t necessarily use products that are 100% natural but I stay away from mineral oil, it never harmed my hair before but without it, my hair does feel and does better. I do love my EVOO, which I use to seal moisture, I get asked all the time, how I get the shine in my hair. Healthy hair + EVOO = shiny hair. Oh and am not worried of ppl touching my hair either, I know they are not going away with greasy hairs. I used to use Blue Magic until just a few weeks ago! So glad I’ve seen the light haha ;D But now I’m just using natural oils, and so long as I maintain my hair, it should grow out thick & long right? Where can i purchase the brown container? omg! i use (well now it’s USED, never touching blue magic again) blue magic coconut oil and i felt like it was damaging my hair more than helping it, because it is just so thick and i thought it was coating my hair rather than moisturising it! its especially a problem in winter months since i live in England (its freezing here lol) and my hair will be so tough to comb through and was sooo dry everyday organic will probably be better for me, gonna switch asap.